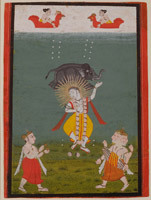 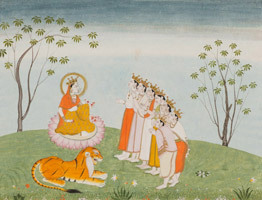 This exhibition is the first in North America to celebrate the diversity of South Asian art by examining the relationship between aesthetic expression and the devotional practice, or puja, in the three native religions of the Indian subcontinent. 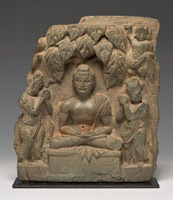 As one of the major presentations of the Santa Barbara Museum of Art's (SBMA) 75th-anniversary year in 2016, Puja and Piety showcases one of the areas of the Museum's Asian Art holdings that has expanded the most in recent years. 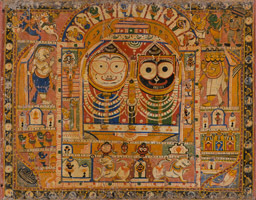 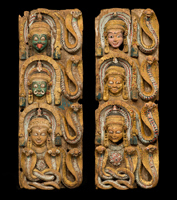 Drawn primarily from SBMA's permanent collection and augmented by loans from regional, private lenders who are longtime friends and patrons of the Museum, the exhibition presents more than 160 objects of diverse media created over the past two millennia for temples, home worship, festivals, and roadside shrines. 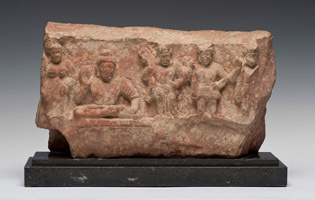 From monumental painted temple hangings to portable pictures for pilgrims, from stone sculptures to processional bronzes and wooden chariots, from ancient terracottas to various devotional objects for domestic shrines, this exhibition aims to examine and provide contextualized insights for both classical and popular works of art.